A Good Education Often Brings Remarkable Rewards. If you were to ask educators why they picked teaching for their lifetime contribution to the world, you would primarily get one of two answers. When they were growing up, they had a teacher who told them that the reason that the student was not doing well was because he or she was incapable of learning the subject. Usually those were opines offered without substantive evidence.� Interestingly those students vowed to show them otherwise, and almost always did. Former Galveston iconic math teacher, Dan Reeves, became a math�professor because a high school teacher had bluntly told him that he was too dumb to learn algebra. Forty years later, not only had Reeves successfully taught high school and college mathematics to thousands, but when he retired, Sam Houston State University named its mathematics center after him. Fortunately there are many more that bonded with a favorite teacher, and then went into that profession to emulating them. This is a story dedicated especially to the Ball High School teaching successes of George L. Morton, Frank J. Vollert, Cpt. Charles Welch, and M. Sgt. William Prentice. In the mid and late 1950s, Morton was principal, Vollert was vice principal, Welch was the ROTC PMS&T and Prentice was the other ROTC instructor. Photo courtesy of Mark Dierlam, III. When Mark John Dierlam, III graduated from Ball High in 1956, he had earned the rank of captain in the ROTC, and that foundation convinced him to make the military his career. His father had been an ensign on a World War I battleship, then a merchant captain until World War II broke out. �Victory ships were (being) produced at a rapid rate, and the Navy needed experienced captains to certify them as sea worthy, and then to take them out for shakedown cruises, so that was what he did until the end of the war,� Mark Dierlam told me. Dierlam went to A&M University, got his degree in electrical engineering, then joined the Air Force and became a pilot. He moved through the ranks and retired as Col. Mark J. Dierlam, III. Throughout his higher education and his career, he had built on the specific mentoring he had gotten from his father and from Morton, Vollert, Welch and Prentice,�while he was at Ball High School. When he became a father himself, he passed what he had learned from his mentors to his three children, Todd, Trish and Scott. Each of them now holds the same rank as their dad in the Air Force.� All three are colonels. And all three of them attended and graduated from the Air Force Academy in Colorado Springs. Todd will soon be moving to Patrick Air Force Base in Florida, Trish is stationed at Lackland Air Force Base in Texas, and Scott is at the Air Force Academy office in Washington D.C.
Like many other Ball High students, Col. Mark Dierlam was mentored and taught by Reeves, Welch and Prentice, as proud administrators Morton and Vollert made certain that a fine high school education was possible for all Ball High students who wanted one. 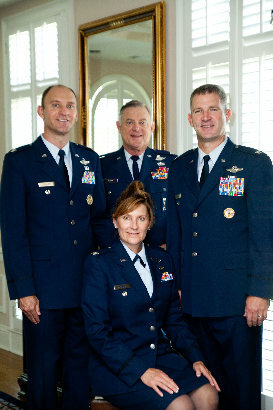 And that military mentoring foundation multiplied as Col. Mark Dierlam drew on it to help his children, Todd, Trish and Scott, to achieve their remarkable academic and military successes. Of course congratulations are due to the extraordinary accomplishments of the Dierlam family. But congratulations are also due to Morton, Vollert, Welch and Prentice who laid the foundation that continues to reap benefits nearly 60 years later, and will ultimately be passed on to Mark and Kay Dierlam's grandchildren. Both are stories that grab my heart. Bill Cherry, a Dallas Realtor and free lance writer was a longtime columnist for "The Galveston County Daily News." His book, Bill Cherry's Galveston Memories, has sold thousands, and is still available at Barnes and Noble and Amazon.com and other bookstores.